Are we restoring the Everglades just so the ocean can swallow a lot of it back up? Eighteen years into the multibillion-dollar restoration of the Everglades, a scientific review committee called Wednesday for a broad re-examination of future projects in light of the changing climate and rising oceans. 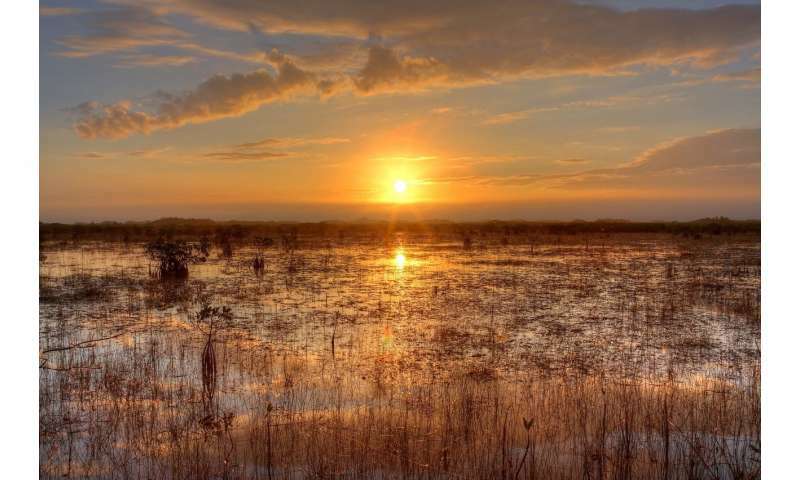 The National Academies of Sciences, which issues a report to Congress every year on the progress of the massive project to restore South Florida's shrunken wilderness, said conditions have changed since the Everglades restoration was planned in the 1990s. "There is now ample evidence that the South Florida climate is changing," stated the latest report. "There is general consensus that temperatures will increase over time, although considerable uncertainty about future rainfall patterns remains. There is also compelling recent evidence that sea-level rise is accelerating. These changes will have profound impacts on the South Florida ecosystem and the related challenges of providing flood protection and meeting future water and recreational demands." The restoration of the Everglades is a joint federal and state project to revive what's left of the River of Grass, filling in canals, removing levees, finding ways to store fresh water and taking other steps to undo some of the damage done over the past century to accommodate farms and cities. "The restoration efforts are likely to have noteworthy benefits that increase the resilience of the ecosystem in the face of climate change, but these benefits have not yet been adequately studied or quantified," said Bill Boggess, professor of applied economics at Oregon State University and chairman of the committee that wrote the report, in a news release. "With seven large projects to be constructed and three more nearing the end of their planning process, this is the opportune time for a mid-course assessment." - "Impressive advances" have been made on water quality, particularly with reductions of phosphorus. An important plant nutrient that has washed off farms for decades, phosphorus must be limited in the Everglades to prevent non-Everglades plants from crowding out sawgrass. - There has been progress is doing work at the ground level, with the completion of two projects to deliver more fresh water to Everglades National Park. - Funding remains slow. If average funding levels for the past five years persisted, it would take 65 years to complete the work. "At this pace of restoration," the report said, "it is even more imperative that agencies anticipate and design for the Everglades of the future."